We came up with more of a schedule for the Youtube live streams especially since Bud is directing people to them to ask him questions. There is a new system in place for getting livestream notifications before they start. Check out the main Live Streams page for the sign up forms and to watch all previous streams. You can also subscribe to Bud's Youtube channel (VapeCritic) to get their notifications when we start streaming. - This stream normally runs 3 hours and there is a vape giveaway at some point during each one. Ask Bud - Technically, you can ask Bud questions in any live stream, but this one is specifically for that purpose and typically runs about 2 hours. Power Hour - This is ~1 hour long and there is usually one or two vapes that are featured the entire time. Breaking Bud - This stream will focus on current news and events, mostly dealing with vapes or cannabis. The run time for this is about 1 hour. You Know What Really Grinds My Buds? - This one will also be about 1 hour long and will be Bud bitching and venting about his grievances with the industry. The only stream that is always at the same time is the Saturday stream. All of the other segments listed above will be streamed at different times during the week, and we try to cover all the time zones by doing some in the morning and some late at night. PLEASE KEEP COMMENTS IN THIS THREAD ON THE TOPIC OF LIVE STREAMS ONLY, THANKS GUYS!! To be more specific (sorry :pray: ) that will only work on public streams. Private streams would require to use the new notification system. soccer moms are the fastest growing segment of mj use so an hour with a womans perspective on vapes and how they effect women would be nice. Many of us have girlfriends and/or wives so knowing the vapes that are easier for them to use and giving them a way to ask questions from a woman who vapes. 100% agree. I'm just getting some family members (women) into it (medicinally) and having another woman explain to them rather than me would be beneficial. According to the new schedule, we're pretty close to today's LIVE Stream. @Dr green thumb @zancru hmmm really??? I was thinking you guys were just fluffin my feathers but if there are actually some females that want to hear from me ... then ... we will have to consider that as a possible add on. Hazel's haze hour :lol: H.H.H. hazel you are someone that women could relate to. I challenge this person who claims to be The Critic of Vapes. 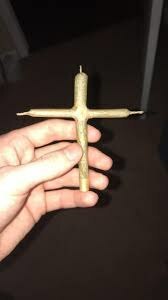 I challenge this Critic of Vapes To Vape a cross joint like the one in the Movie The Pineapple Express. Fully loaded. did you just call me triple H? :lol: Just kidding. I would like to see you try the arizer solo 2 and the arizer Argo vs the fw5 and milaana 2. Also the appraisal section as well. Starting with the sticky brick jr.
@Hazel challenge accepted streams would be awesome! I dig it. You may have missed your true calling. Like a Frank Lutz for weed phrasings.